Is There An Upcoming Bape x Asics Gel Lyte 5 Set To Release? Bape and Asics are both separately notorious for creating some of the dopest collabs in the game. As both companies continue their strong collaborative momentum this year, it was only a matter of time until they both finally came together to create something special. 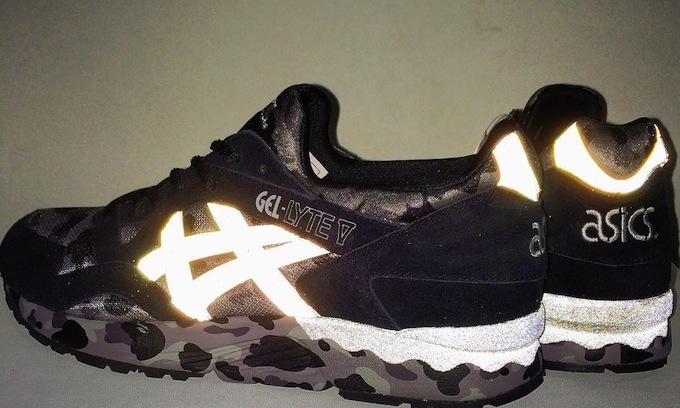 The first photos of the Bape x Asics Gel Lyte 5 have leaked, and you don't want to miss them. The Bape x Asics Gel Lyte 5 looks to be mostly covered in Bape's signature Camo design throughout the entire sneaker including the midsole and insole. Black nubuck overlays compliment the design adding some depth to the appearance. To finish things off, Dual branding on the insole and 3M on Asics' signature stripes make the sneaker shine bright. While this is the first we're seeing of the sneaker, stay tuned to SneakerShouts as we keep you updated with the latest information!